Privigen is a 10% solution of human immunoglobulin(antibodies) (10g/100mL) prepared from pooled plasma donations made from European and North American donors for intravenous use. It is intended for short-term use (less than 3 months) and is provided only from NZBS-managed blood banks. This is explained in a letter from NZBS's National Medical Director and in the October Blood Issues newsletter. For longer term use or for intravenous immunoglobulin supplied by DHB-managed blood banks, please see Intragam®P. Because Privigen is an expensive medication with increasing demand, pre-approval of new patients receiving Privigen is required. Please see the guidelines provided on the right and complete the preapproval form, also on the right. If urgent, please contact the Transfusion Medicine Specialist on call. Do not shake the bottles (causes frothing). Use a vented infusion set or a standard infusion set with a venting spike. Spike the bottle stopper in the centre to minimise stopper dislodgement. A blood filter is not needed. If not used, please return to Blood Bank promptly. 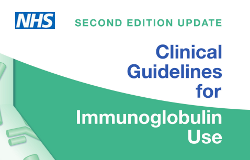 Patients with Group A red cells should be monitored for haemolysis (see manufacturer's instructions) as Privigen contains anti-A and anti-B antibodies. The first infusion should be administered at an initial rate of 0.3 mL/kg/hour. If the infusion is well tolerated, the rate can be doubled at 30 min intervals to a maximum rate of 2.4mL/kg/hour, at the discretion of the healthcare professional and as tolerated by the patient. For subsequent infusions a similar step-wise approach can be used, as tolerated. i.e. commence at 0.3mL/kg/hour, increasing the rate every 30 minutes, as above. For PID and CIDP, the maximum infusion rate is 4.8 mL/kg/hour, but only from the fourth infusion onwards. For all other conditions, the maximum infusion rate is 2.4 mL/kg/hour. Rates are discussed in detail in the CSL Behring Product Overview. In patients at risk for acute renal failure, thromboembolic adverse reactions, IVIg products should be administered at the minimum rate of infusion and dose practicable. There is no need to slow the infusion down if changing between bottles of different batch numbers of Privigen. children under 15 kg should only receive the 5g bottle size. children weighing 15-30 kg should only receive 5g or 10g bottle sizes. children and adults weighing 30kg or more can receive 5g, 10g or 20g bottle sizes. It is recommended that the patient's vital signs and general status are monitored regularly throughout the infusion. Monitoring should be similar to that of a other IVIG products. There is no change in monitoring between bottles. 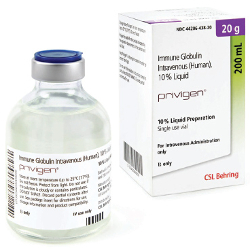 See for more details on monitoring of an IVIG product. Monitoring should also include urine output and serum creatinine. For patients who are naïve to human Ig, switched from other Ig, or who have had a long interval since previous Ig infusion, monitor for an hour post infusion. All other patients only need to be monitored for 20 minutes post infusion. In case of an an adverse reaction, the rate of administration must be reduced or infusion stopped. The treatment required depends on the nature and severity of side effect. Report all adverse events to Blood Bank – contact your local transfusion medicine specialist or transfusion nurse specialist for advice. Replacement therapy (for immunodeficiency): adjusted for the individual patient. Typically 0.2 - 0.8 grams Privigen per kg bodyweight per month. Higher doses may be needed initially following diagnosis (0.4-0.8 g/kg). ITP: optimal dose determined for each patient. Up to 2 grams Privigen per kg bodyweight divided over 2-5 days. Guillain Barre Syndrome: 0.4 grams Privigen per kg bodyweight per day over 5 days. Kawasaki's Disease: 1.6 - 2 grams Privigen per kg bodyweight divided over 2-5 days or 2 grams per kg as a single dose. This calculator will calculate the number of 5, 10 and 20g bottles you need as well as the rates and time taken to infuse it.